Play only if it is Summer. Any phase: Play if you have lost a challenge this phase. 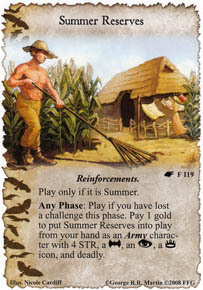 Pay 1 gold to put Summer Reserves into play from your hand as an Army character with 4 STR, a Military, an Intrigue, a Power icon, and deadly.